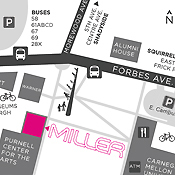 "The Miller Gallery at CMU is an amazing resource for the CMU community and the city of Pittsburgh thanks to its innovative programming and first-class exhibitions. I'm very happy to count it as one of our collaborators, and I encourage people to make a point to visit." 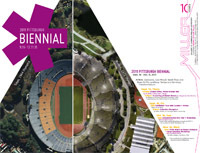 Setting a new precedent for city-wide collaboration among major art institutions, the 2011 Pittsburgh Biennial is co-organized by Carnegie Museum of Art, Miller Gallery at Carnegie Mellon University, The Andy Warhol Museum, and Biennial founders Pittsburgh Filmmakers and Pittsburgh Center for the Arts. Each of the five partner institutions will present a distinct exhibition of work by artists connected to the Pittsburgh region, reflecting each organization's curatorial focus. The Miller Gallery at CMU's presentation features artists who work collaboratively, with projects that demonstrate the strength of collective voices in deciding the future of neighborhoods, cities, nations, and societies, and the importance of intimate conversations and compassionate listening. Organized by gallery director Astria Suparak, the exhibition unveils four new installations and two recent projects, and includes sculpture, printmaking, painting, video, publications and workshops. Meet on 1st floor of Miller Gallery at CMU. Margaret Morrison Hall #203, 2nd floor. At Margaret Morrison and Tech Streets, South of Forbes Ave. and next to CMU tennis courts. Events like the Olympic Games and World's Fairs are undoubtedly spectacles on a massive scale. World's Fairs construct cities within cities, giving visitors the opportunity to see the most up-to-date wonders of the world in one space. The Olympics broadcast the world's most accomplished athletes into hundreds of millions of homes. Each event leaves footprints visible from satellites and makes its mark on national budgets. This lecture will tell the story of common patterns and characteristics these mega-event share, creating similar effects on the people and places that host them. What do cities like Seoul, Atlanta, New Orleans, Shanghai and London have in common? How does the promise of media spectacle reckon with development on the ground? Meishi Street documents the demolition of Dazhalan, one of Beijing's oldest and most famous historic neighborhoods, located next to Tiananmen Square. The film traces conflicts caused by the imbalances between development and preservation, modernization and tradition, and governmental decrees and individual rights that resulted from Beijing's unprecedented urbanization process during the run-up to the 2008 Olympic Games. Given video cameras by the filmmakers, several evictees shoot exclusive footage of the eviction process, adding vivid intimacy to their story. 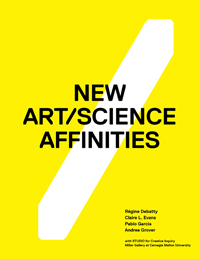 Presented by the CMU School of Architecture in connection with the Pittsburgh Biennial at the Miller Gallery. CMA Theater, 4400 Forbes Ave., 1 block West of CMU. @ Miller Gallery at Carnegie Mellon University, Purnell Center for the Arts, 5000 Forbes Ave., Oakland. @ The Andy Warhol Museum, 117 Sandusky St., North Shore. @ Pittsburgh Center for the Arts, 6300 Fifth Ave., Shadyside. Email miller-gallery@andrew.cmu.edu to RSVP + for location in North Braddock.